David R. Heffelfinger's Ensode.net - Fedora Core 4's Native Eclipse, is it Ready for Prime Time? 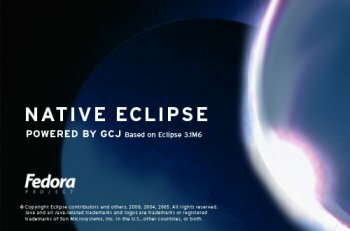 Fedora Core 4's Native Eclipse, is it Ready for Prime Time? One of the new additions of Fedora Core 4 is a natively compiled version of Eclipse. I took it for a spin to see if it is a suitable replacement for "regular" Eclipse. Incremental compilation (save a Java file and it is immediately compiled, along with any other files that depend on it), this feature gives the developer immediate feedback, shortening the code - compile - run cycle to code - run. Hitting ctrl-1 will offer correct suggestions for fixing most warnings or compilation errors, saving a lot of time for the developer. Typing the first few letters of a variable, class, object, method, field or constant and hitting ctrl-space will autocomplete the name of the variable, class, object, method or field. When I opened Fedora's native Eclipse I noticed my laptop became slow and unresponsive, and the CPU usage skyrocketed to 100%. Eclipse took a very long time to open (I didn't measure, but I estimate it took about a minute). Even after opening, the laptop was still unresponsive, and the CPU usage was still at 100%. I then noticed that it was opening my work project (you know, the one with over a quarter of a million lines of code). Eventually it did open it, but it felt like it took forever. I thought it was odd that it tried to open the project without prompting me what workspace to use, since I have Eclipse set up to ask what workspace to use on startup. I closed the project and manually changed the workspace to another one I have for personal projects. Just to make sure native Eclipse was inheriting normal Eclipse's setup, I checked native Eclipse's setup and oddly enough, it was set to prompt for a workspace at startup. I re-applied the settings and restarted Eclipse, it still did not ask me what workspace did I want when it started, and again, it opened my work workspace, the one containing my huge project. At least it didn't open the project, making the startup much faster. My work project directory is called "workspace" and it is right under my home directory. This is the default project location Eclipse creates, native Eclipse went straight to this location every time I opened it, not remembering I had switched workspaces before, like normal Eclipse does. After switching (again) to my personal projects workspace, I created a new Java project, and added the ubiquitous "Hello world" class, everything worked as expected. To make things a little more interesting, I added some code using generics, which is a new feature added in JDK 1.5, aka Java 5 and purposefully added some invalid code. Native Eclipse correctly flagged the invalid code. 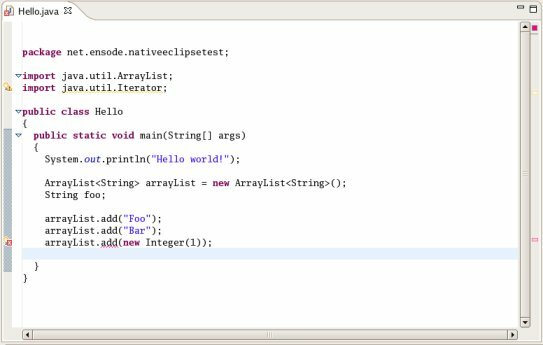 I then proceeded to use Eclipse's auto complete feature to create a for loop iterating over the ArrayList, the generated code was not generics friendly, it used an iterator without using generics, and created a cast inside the loop. For completeness' sake, I tried the same exercise under standard Eclipse and got the same result, therefore this behavior is not specific to native Eclipse. After fixing the generated for loop to use generics, I saved the file and attempt to run the generated class file using the GNU Interpreter for Java (gij), I was gladly surprised that it worked without any problems. It was surprising to me since I have native Eclipse set up to generate Java 5 code, and I was under the impression that gij only understood JDK 1.4 and below code. After I was done playing around with my simple hello world app, I opened another project I have in my personal workspace. This particular project has about 67,000 lines of code. Native Eclipse opened it without a hitch. I made some simple changes here and there, and found nothing out of the ordinary. 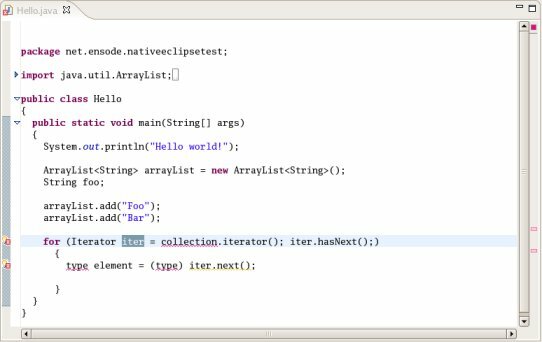 Is native Eclipse ready for prime time? I believe that for all but the largest projects it is. It is now feasable to develop Java applications using nothing but Free/Open Source software, especially since the generated code is compatible with gij.